Dolly (by Dolphin St) is half owned by Jodie Young, from Darraweit Park. Dolly has produced 3 foals to date. Her first was a stunning WB colt by AJ Maximus. He has now been sold.Maestro has now been broken in and spelled as a 3yr. Dolly had a stunning WB filly , Waldarrah Donna, in October 2009, who has also sold as a weanling. Dollys 2011 foal by FDL JD will be for sale, please enquire if interested . She is now sold. Dolly is in foal this season, 2013, to WB stallion Whisper. Due early October. FLUER DE LYS TEQUILA - (owned by FDL Stud) and leased out to Waldarrah. Que is a lovely big strong mare by FDL Jack Daniel, Her first show under saddle was a local show at Kilmore in December 09. She came home with 2 2nds and a 4th. She was perfectly well behaved and was a pleasure to take out. 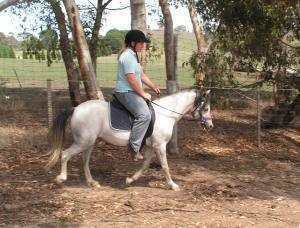 Ariel is a section C welsh pony of cob type 12yo mare. She is by Lambrook Park Dackery out of Thorpville Angela. Ariel has had a stunning colt foal by FDL Jack Daniel, who is now a 3yo.Ariel had a cracking chestnut colt by Dan in 2011. Natasha Sammit is now the VERY proud owner of Waldarrah Kentucky Deluxe. Ariel has now been covered by Illarak Desert Sands (Palli part welsh) 28/9/11.Ariel has now had her 4th foal, a stunning black filly. Candy has had 2 foals. Thorwood Cinnamon 2008 filly and Thorwood Candyman 2010 colt. She is now back in foal to Silkwood Puss in Boots for a 2011 foal. Bethany, a section A welsh mare was purchased from Del Lee Stud in October 2007 as one of our foundation mares. She has been a delight to handle and has since been broken in and then put in foal to a Section C Cob. Bethany has had a ripper first foal, Ally, who will be retained by Waldarrah. SOLD to a wonderful show home, i wish the new owners all the very best with her. Flower is for sale to the VERY best of homes only. Flower is a section C Welsh Pony of cob type,by Eira Christmas. She has an awesome temperament and movement to go with it. Flower has now had a gorgeous chestnut colt by FDL Jack Daniel. Thanks to Ablue Moon Images for this lovely shot.